Have you ever felt lethargic when it comes to your study sessions? Feel like you’re reading the same paragraph repeatedly without having retained any type of information? As a student, you need to be eating a balanced, healthy diet and partaking in regular exercise. Combined with a regular sleeping pattern, these three aspects are truly the key to good health and keeping you feeling your best at home and at school. 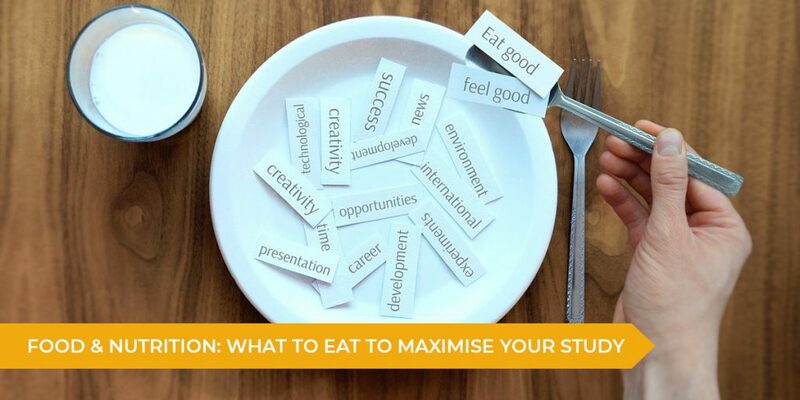 We’re serving some nutritional tips and tricks which have even been found to influence cognitive function and help you concentrate when it comes to retaining information and sitting any examination with confidence. Fish in general is high in protein, which means it’ll keep you feeling full and satisfied for longer. Although the power of salmon is that it’s extremely rich in omega-3 fatty acids which directly influences the quality of your brown cells. Salmon is also packed with vitamin B12 which nourishes a healthy brain and nervous system. You didn’t expect this one to be so high on the list, did you? Cauliflower is a cruciferous vegetable with a high source of choline, which is an essential nutrient that aides in breaking down your food helping your metabolism. Incorporating cauliflower into your diet has also been known to boost cognitive function; meaning you can remember things for longer! Also known as a another food which contains choline, eggs are also a great option if you’re looking for a source of protein to incorporate into your breakfast, lunch or dinner. Not only are they shaped like a brain, but walnuts are a quick and easy snack packed with alpha-linolenic acid. This is a type of omega-3 fat that your body uses to make DHA which is an essential part of any healthy diet. Keep a handful of walnuts in your bag and snack on them at any time of the day! Brown rice is full of B vitamins which ultimately converts an amino acid called homocysteine into important brain cells. Replace white rice with brown and see the difference for yourself! It’s 2019, who doesn’t love a side of avocado with their toast? Avocado is packed with omega-3 fatty acids (the good kind of fat) which help protect cell membranes from free radicals. If your taste buds aren’t a huge fan of some of the other foods we’ve talked about, they’re sure to love berries. Almost all types of berries have high levels of anthocyanidins and flavanoids which help to combat the signs of cognitive decline. Keep some berries in your freezer and add them to your smoothie, breakfast bowl or snack on a handful throughout the day if you have a sweet tooth. Almonds, sunflower and pumpkin seeds are all high in protein and fatty acids. We love them so much since they are quick and easy snack if you’re always on-the-go. This might taste somewhat bitter at first, but trust us, green tea is another great item to add onto your list. Green tea works by boosting dopamine levels to increase memory and concentration. We’ve saved the best for last! Trade the milk chocolate for dark, which actually has no dairy and is better for your health in the long-run. Loaded with antioxidants and free radicals which help keep your body regulated. What are some of your go-to foods when it comes to studying? Are there any type of foods which you strictly avoid? Become a termly or yearly student today at Talent 100, and we always keep the fridge and pantries fully stocked with healthy and nutritious foods and drinks! To find out more about our classes or enrolment opportunities, click here or call our Student Services team on 1300 999 100.